The creature I held in my mind for almost forty years. I used to daydream about Purugama, the flying cougar, when I was ten or eleven years old. He becomes Conor’s mentor and best friend in Book One: Breaking the Barrier. I love the fact that I kept him with me for so long and finally wrote a story about him. Book Three has just been released. The story is real, it’s alive, and every character has become a living entity to me. There are a lot of good books around, but only a handful of great stories. Conor and the Crossworlds is a great story, and I won’t stop promoting it until the whole world has a chance to enjoy it. The Champions of the Crossworlds are all giant cats who can talk and cast magical spells. They all have very distinct personalities; I have grown to love them deeply. Maya, the Lord of the Champions, was a real cat who lived next door to me in San Diego. He got killed by a pack of dogs one day, and I told his mistress I was going to make him immortal. If you knew Maya like I did, you would understand why I made him, an alley cat, the leader of the great wild cats – the Champions of the Crossworlds. What makes this a series that other people MUST read and WHY? I love great stories, and I love sci fi / fantasy. I love the escape it provides. The characters in this story are very compelling; you will grow to love them as much as I and others do. Conor’s journey through all five books gets wilder and more complex as you continue to read. I wrote this series for kids, but people of all age groups seem to love it. Every school librarian tells me the same thing, that Conor and the Crossworlds is never on the library shelf. When a student returns a book, another student is with them wanting to check the book out. That’s a huge compliment to Conor and the Crossworlds. I’m pretty twisted; it comes from being Irish I guess, so creativity has never been a problem for me. I finished writing the series two years ago, but I remember during the five years when I wrote it, I always thought about what was going on in the story. When I got up in the morning, went to bed at night, when I was teaching, driving, shopping, anything, I always had my mind on the story. So when I finally sat down to write I had oodles of thoughts ready to put down. Another thing I always tell students at book talks is to write with abandon. I think everyone has creative juices, but as a college professor, I see how formal education stunts that part our minds. The cool thing about fantasy writing is that you just make everything up, and if you can do that, why would want to restrict your mind? Look at Conor’s arch enemy in his pristine form (he’s a shape-shifter). How could I have come up with a freak like that – a beetle head with squid legs and no torso, but he’s wearing an English waistcoat – if I was restraining my creativity at all? I guess the secret is just sitting down and letting her rip, that’s what I always say. You have to trust yourself and the story. Your characters will tell you where to go at the next bend in the road. So write with abandon! For me it was getting past the “favorite time to write” syndrome. I’m a morning person, so naturally I love to write in the morning. If you’ve made a commitment to write every day, though, things might get in the way of your morning writing time. I had to learn that any time of day was good for writing. I also had to learn that any amount of time was good as well. I would e-mail sections of books to myself and when I found a spare half hour, I would locate a computer, download the story and write for thirty minutes. I found that with a limited amount of time I could fulfill my daily page requirement as easily as when I had all morning. The direction my life was headed, the direction the country was headed, and the fact that I’ve always felt I was put on the earth to do something special, I mean something really spectacular. I wanted to make a contribution to the world, and writing seemed to be a way of accomplishing that. I’ll tell you something I’m about to do – I’m about to make a big sign that says, “NBC doesn’t like teen readers,” and walk around downtown San Diego with it. I have this great promotion coming up, The Hunt for the Five Keys of the Creators, and I’ve been bugging the local news stations to put it on the air. Unfortunately I haven’t made much progress. 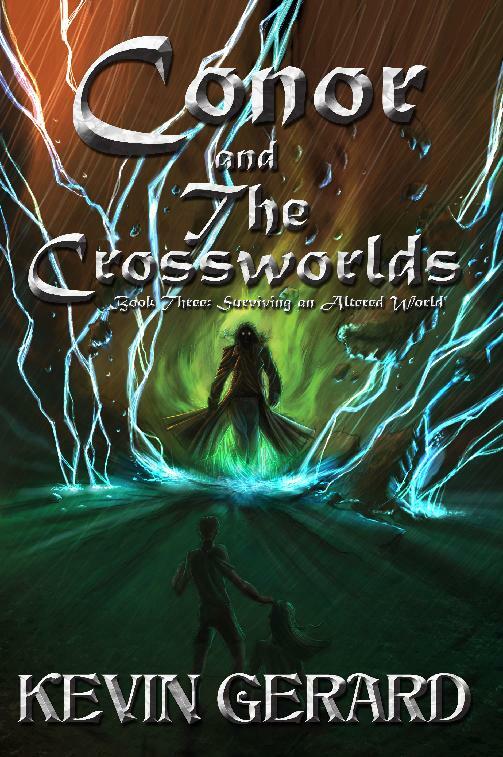 Check it out on my website – http://wwwconorandthecrossworlds.com – it’s going to be awesome, but I can only spread the word so much doing book talks. I want all the kids in San Diego to be able to hunt for the key I’ve hidden here, so I need TV coverage. I think they’ll get the message if I make my sign and show everyone in downtown San Diego how I feel. I spent the summer making data files of every middle school in America, and right now I’m calling every librarian to introduce the series. I call, talk for a bit, ask if I can send an e-mail, and then I send it. So far I’ve contacted about ten states. Should take me until about March or April to finish my lists I think. I’m all over MySpace, and I think it’s a very good tool. Every time I see a new teen librarian, I send them a message asking if they would like some free book posters for their teen room. It costs me about ten bucks to send them. One day I contacted a librarian at a college, it turned out that this month was fantasy fiction month and every woman at the college was into fantasy adventure books. So I sent copies of books and posters and I get to be featured in their month long festival. I’m also involved in a Blog Tour with Nikki Leigh. I think she’s got her finger on the pulse of viral marketing. The internet has such massive potential, so I’m excited about seeing what she can accomplish. I chose the Crossworlds as my setting because it is infinite. It is an endless series of worlds of light and darkness where anything can happen. What could be better than that for a fantasy writer? There are four main venues that Conor and the other characters populate from time to time. The realm of the creators is the home of the Council of Seven, a group of creators emeritus who oversee the Crossworlds. It is a place of unparalleled beauty and wellbeing. It is where Conor and the Champions go to rejuvenate themselves and prepare for battle. The Glade of Champions is the world where the giant protectors of the Crossworlds live. Heavily forested and filled with lakes and small hills where the great cats can sun themselves, this is where Conor first meets Purugama’s brothers. Earth – Conor lives there with his family in Northern California. His girlfriend Janine, introduced in Book Three, also lives there. The Shadow World is the home of the Circle of Evil. The destroyers; Drazian, Gandron, Fumemos, Seefra, Pikiwik Loff, and the horrible assassin Nemelissi all stage their attacks in this place. Zelexa, the Lady of the Shadows, controls this world along with the three arcs of the ruling body. Circle of Evil, and so on. I think the one thing that makes the Crossworlds unique is the aspect of organic life. Almost everything in the Crossworlds is organic, including the corridors, transmission portals used to travel to other worlds. They are living beings, and as you walk through them you can feel their presence. I like Conor because he is a good kid. He doesn’t swear, do drugs, or treat people badly (unless they have it coming). He is, however, a young man bursting with curiosity. There’s also something that only I know about Conor. The rest of you will have to wait until the end of Book Four to find out. All I’ll say at this point is there’s a reason the creators sent Purugama to Conor in the first book, and it’s not the reason stated in the story. Conor’s girlfriend Janine becomes a heroine in her own right. She enters the story in Book Three, and before she knows it, she becomes quite involved in the Crossworlds. Like Conor, she’s a good kid, and also smart, athletic, and adventurous. Both of them are pretty fearless. Things get pretty scary as they get deeper and deeper into the Crossworlds, but they always answer the call and step into the next adventure. The Circle of Evil has four levels of combatants; destroyers, shadow warriors, slayers and keepers. The destroyers are the most powerful, and Conor gets to do battle with them one on one pretty regularly. Seefra is Conor’s nemesis throughout the story. He is the leader of the destroyers and very powerful. He can shape shift himself and his environment. He really causes the most friction in the story, because he keeps popping up to bother Conor (and Janine). There’s a whole group of destroyers, however, and each is quite compelling in his own right. Fumemos is a formless entity who uses the elements of nature to fashion monsters with which to attack Conor. On one planet he hides in the ocean waiting for Conor to approach and then uses the seawater and sand to create a monster that attacks him. In Book Five, Conor has to do battle with the most horrible destroyer of all, Nemelissi the assassin. Nemelissi is one sick creature. It lives to kill, and does so in some very amazing ways. For example, it can vomit red hot lava all over its enemies – WhEw!